NordicTrack is one of the best-known manufacturers of high-quality home fitness equipment and is a now a renowned and highly-successful company which has grown from very humble beginnings. The company was originally founded by Edward and Florence Pauls in 1975 in Minnesota, where Edward, a gifted engineer, developed the company’s first cross-country NordicTrack ski simulator in his garage, with the intention of training for his local cross-country race. As a result of the high-quality engineering, and associated health benefits, the original NordicTrack machine was extremely successful and was renowned for providing a full-body workout. Since those beginnings, the company has grown and is now a part of the market-leading ICON Health and Fitness group. Nowadays, NordicTrack operates in a wide range of international markets, including the UK, USA, Canada, Australia, France, Italy and Spain, and NordicTrack fitness machines can be found in homes all over the world. NordicTrack is now the world’s number one manufacturer of home fitness equipment and developed a range of extremely high-quality treadmills in the 1990s. Due to NordicTrack’s unique combination of research-informed engineering, sleek design and unique style, there has never been a better time to own a NordicTrack treadmill in order to give your workout the edge and improve your performance. There are now a wide range of NordicTrack treadmills available to suit your style and your budget, whether you are a home user or whether you are a commercial user. All NordicTrack treadmills are extremely durable and feature a wide variety of advanced technological features as standard. If you are a home user who wants to get serious about your workout, an excellent starting point is the NordicTrack C-Series range of treadmills. 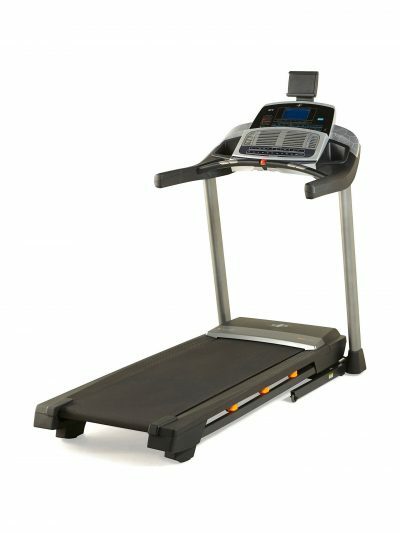 Despite being an entry-level model in the NordicTrack range, the NordicTrack C700 model features the same high-quality engineering found as standard on all NordicTrack models and includes a wide range of features which will maximise your workout, as well as having the advantage of being able to fold up through the innovative NordicTrack SpaceSaver design after your work out – the C700 is therefore ideal for a home or office where space really is at a premium. The C700 will kick-start your training from the moment you own it, as the treadmill features 20 different pre-loaded workout programs as standard, all of which have been developed by professional personal trainers. You can keep track of your favourite shows and music whilst you work out due to the integrated tablet holder, which delivers high-quality sound through dual in-built speakers and is Bluetooth and iPod-compatible. The C700 is not just about entertainment and allows the user to easily adjust the incline from 0% to 10% at the touch of a button, which allows you to quickly change the focus of your workout. The C700 also benefits from an integrated heart-rate monitor and you can easily keep track of your distance, heart rate, and calories. The C700 has a maximum speed of 20 km/h, allowing you to cover all workouts from a gentle walk to a sprint. Another fantastic feature of the C700 is the easily-adjustable FlexSelect double cushioning system, which allows you to easily switch between running on a soft surface, or a firm stable surface which is just like running on the road. The new NordicTrack C990 model is a fantastic machine which takes all of the features of the C700 and adds even more functionality, including a more powerful 3.0 continuous horsepower motor and fantastic 7-inch, Smart HD integrated touchscreen which has full Google Maps functionality. You will also benefit from an extremely high-quality aircraft-specification 2.5-inch rear roller, meaning that your workouts will be smoother and quieter as a result of the high-quality engineering. The NordicTrack C990 is capable of a 12% incline and a maximum speed of 22 km/h and to take advantage of increased performance, you will benefit from a free 1-year iFit membership with customised goal training. The fantastic NordicTrack T-Series range of treadmills builds on this performance for the serious home user. The T10.0 model features a smooth, quiet, high-performance 3.0 continuous high power motor, dual Autobreeze fans, and features a 7-inch backlit display and integrated tablet holder. The T12.0 features a fantastic full-colour, capacitive 7-inch touch display and will really maximise your workout with 36 workout apps, all designed by professional personal trainers. The flagship T14.0 features the same high-quality engineering and has the top-of-the-line 7” smart-HD console and dual EKG grips, and full BlueTooth chest strap compatibility, to really allow you to monitor your workout, second by second. The brand-new for 2019 NordicTrack Incline Series also benefits from the same high-quality engineering and innovative features found on the C-Series and T-Series, whilst allowing you to work different muscles. The X7i, X9i, X11i and top-of-the line X22i all feature high-performance motors as standard and allow users to select from a -3% decline to an amazing +40% incline to really maximise the workout, with features including integrated iFit and heart rate monitoring compatibility. Finally, for commercial users, our Commercial 1750, exclusive Commercial 2450 and Commercial 2950 treadmills offer unparalleled durability and are built to last in even the most demanding environments. However these treadmills are built to the same high-quality specification and the 2950 features a high-performance 4.25 horsepower motor with a maximum speed of 22 km/h, whilst offering your users our exclusive Runners Flex cushioning system for the ultimate in comfort.